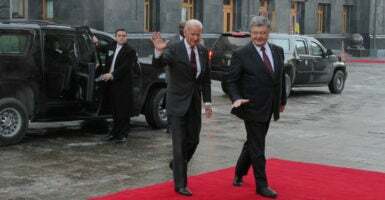 KYIV, Ukraine—Making his last visit to Ukraine as U.S. vice president, Joe Biden, true to form, had a blunt farewell message—hang tough in the war against Russia and its proxies in the east, but don’t let up on the nationwide corruption crackdown. U.S. President Barack Obama is the first sitting president to not visit Ukraine since it declared independence from the Soviet Union in 1991. In contrast, Monday marked Biden’s sixth trip to Ukraine as vice president, and his fifth after the country’s 2014 revolution. The visit came at an existential crossroads for the war-torn, post-Soviet country. Ukraine is fighting a nearly three-year-old war against a combined force of Russian-backed separatists and Russian regulars in the country’s east. Meanwhile, changing political landscapes in the U.S. and the EU have Ukrainian officials on edge. For one, there are concerns that U.S.-Ukrainian relations might chill under the administration of U.S. President-elect Donald Trump. According to reporting by Politico, Poroshenko signed a $50,000 a week contract with a Washington lobbying firm to improve relations with the incoming Trump White House. “We respect the democratic choice of the American people and are ready for effective and fruitful cooperation with the new administration,” Poroshenko told reporters in Kyiv on Monday. Throughout continental Europe, nationalist anti-establishment political parties are challenging the status quo. Ukrainian officials are worried that if Russia-friendly candidates win elections this year in EU countries like France and Germany, then the EU’s punitive sanctions against Moscow, which were put in place for Russia’s military interventions in Ukraine, will be at risk. During Monday’s visit, Biden also pressed Ukrainians to pick up the pace of anti-corruption reforms. 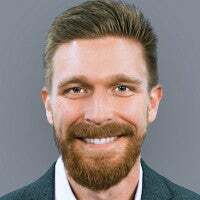 While some progress was made in 2016, including an online system for Ukrainian officials to declare their assets, corruption is still rampant across all strata of Ukrainian government and society. “It’s up to Ukrainian leaders and people to put the needs of the country above narrow personal interests, to place the general good above point scoring and local prejudice,” Biden said Monday. The war in eastern Ukraine—Europe’s only ongoing land war—has so far killed more than 10,000 Ukrainians and displaced about 1.7 million. A February 2015 cease-fire called Minsk II has failed. A static, limited war continues along the frontiers of two breakaway territories in the Donbas, Ukraine’s embattled southeastern territory on the border with Russia. Every day along about 250 miles of front lines, the opposing camps trade artillery, mortars, rockets, and small arms shots. There is no international mechanism in place to enforce the cease-fire other than the threat of more Western sanctions on Moscow, and the prospect of more, or less, international aid for Kyiv. The Minsk II cease-fire is monitored by a multinational group called the Organization for Security and Cooperation in Europe, or OSCE. In 2016 alone, OSCE monitors logged more than 300,000 “cease-fire violations” in eastern Ukraine. 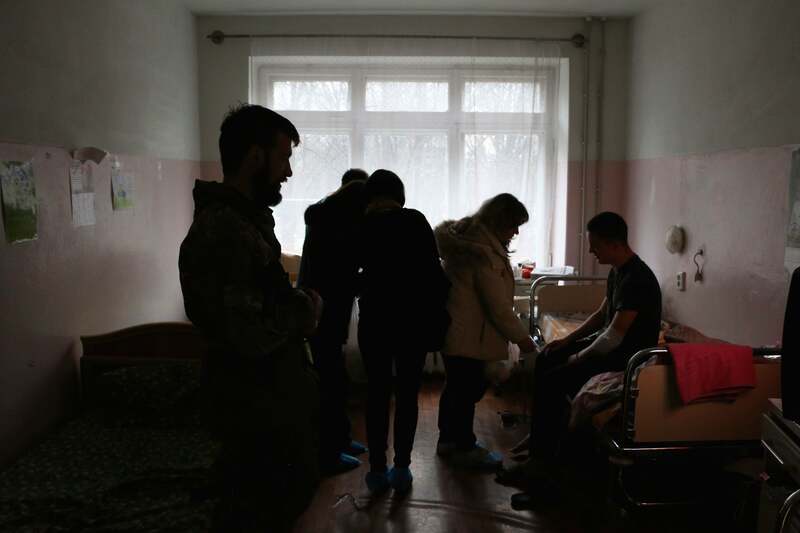 Ukrainian women deliver supplies to wounded soldiers at a hospital in Mariupol. “With the exception of the first of September, we have not had a single day in which we have not recorded cease-fire violations,” Alexander Hug, principal deputy chief monitor of the OSCE Special Monitoring Mission to Ukraine, told reporters during a Dec. 22 briefing in Kyiv. OSCE monitors identify cease-fire violations through direct observation, or by hearing the sounds of explosions or small arms fire. However, each shot fired is not a unique violation. A single cease-fire violation might, in fact, comprise numerous individual attacks. On Sunday, the Ukrainian military reported that combined Russian-separatist forces had attacked Ukrainian positions 60 times in the previous 24 hours. The attacks comprised 122 mm artillery, mortars, automatic grenade launchers, infantry fighting vehicles, and small arms. One Ukrainian service member was killed and three others were wounded in the fighting, the Ukrainian military said. Crimea, the Ukrainian peninsula Russia illegally seized in 2014, remains a flashpoint between Russia and Ukraine. Border skirmishes along the Ukraine-Crimea border in August and a Ukrainian missile test in December nearly took the two countries to all-out war. The Russian military announced on Friday that a battery of advanced S-400 surface-to-air missiles deployed inside Crimea is now operational. The missiles’ range covers about 60 percent of Ukraine’s territory up to an altitude of 90,000 feet, according to an analysis by IHS Markit. In the Donbas, Russia has placed about 600 tanks, 1,300 combat vehicles, 860 artillery systems, and 300 multiple-launch rocket systems, Ukrainian Defense Minister Stepan Poltorak said recently. Poltorak estimated combined Russian-separatist forces in eastern Ukraine’s breakaway territories comprise about 40,000 troops, including 5,000 Russian soldiers. “Of course, with this military buildup, it is very difficult to talk about peace, especially with those who do not wish to fulfill the Minsk agreements or is very aggressively against Ukraine,” Poltorak said on Ukrainian TV. 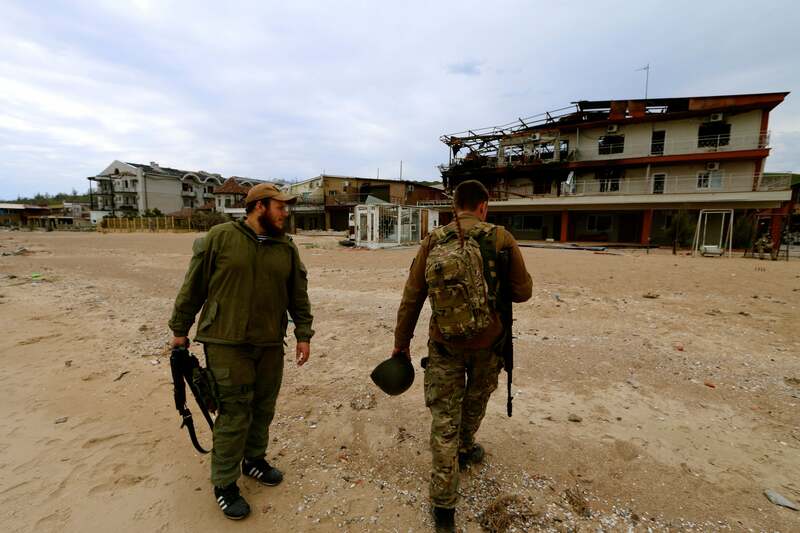 Ukrainian soldiers in the front-line town of Shyrokyne in 2015. Speaking to reporters in Kyiv on Saturday, Oleksandr Motuzianyk, a Ukrainian Defense Ministry spokesperson, said the conflict was set to escalate. “The expansion of the geography of hostilities and the total number of enemy attacks indicate that the enemy is not going to fulfill Minsk agreements and is set to escalate the confrontation,” Motuzianyk said. Biden also made the point, however, that the peace process could not move forward until Russia stops feeding the conflict. “Let me be perfectly clear that political agreement cannot be implemented until Russian violence stops,” Biden said. 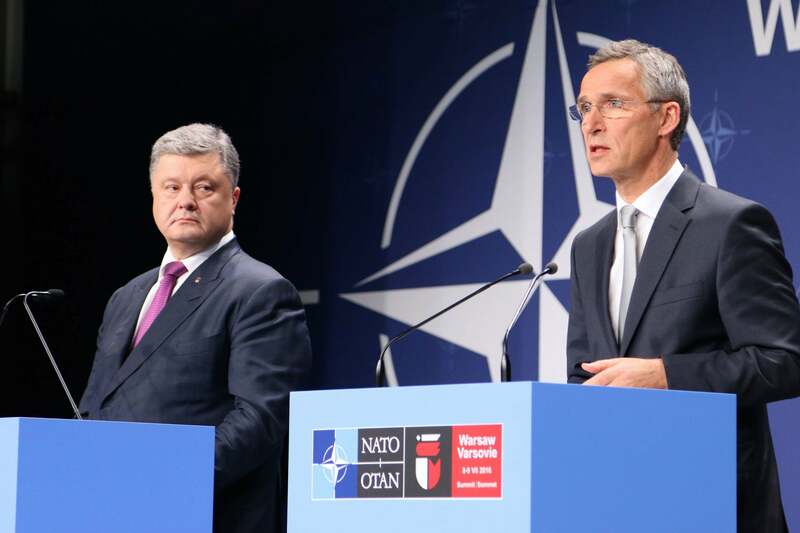 Russia has repeatedly denied its involvement in the war. On Tuesday, the day following Biden’s visit, the Ukrainian military reported that combined Russian-separatist forces attacked Ukrainian positions 41 times in the previous 24 hours, using 82 mm mortars, automatic grenade launchers, and small arms.